Is gluten free diet inferior in any way to gluten containing diet? Gluten free diet does not lack any nutrients and is absolutely healthy provided a balanced diet is consumed. However, most experts would recommend micronutrient supplements like iron, calcium and vitamins at the time of diagnosis of celiac disease as most celiacs are found deficient in these at the time of diagnosis. People with wheat allergy can eat wheat occasionally but it is strictly forbidden for people with celiac disease. Why? This is not true. People with wheat allergy should not be consuming any wheat products except on a trial basis in the doctor’s clinic. Wheat allergy is a temporary disorder and blood tests would help to determine if the antibody levels have reduced and then a trial could be done under medical supervision only. Isn’t gluten free food very difficult to obtain in India? This is a common impression but is not true. India has many gluten free grains which are grown locally and are hence available in abundance and at reasonable prices- jowar, bajra, makki, ragi, kuttu, cholai etc. Daal, rice, vegetables and fruits form part of our everyday food which are inherently gluten free. All non- vegetarian foods, like plain meat, fish, and eggs are also inherently gluten free. In fact, world over, Indian cuisine is considered as one of the most popular cuisines by the gluten intolerant community! One of the main challenges, though, is lack of information about gluten in packaged products and limited dining out options in India – Hence the perception that gluten free food is difficult to obtain in India. Is gluten free food expensive? No. All fresh and natural ingredients which can be used for preparing a gluten free meal are locally grown and easily available in India. Many of these would be used presently in the kitchen too. However, packaged gluten free food products are sold at a premium worldwide. It is advised that you learn how to prepare atleast some of these at home. Learning to bake a bread, biscuits and cake at home would be helpful if you have a celiac child at home. Read our recipes to learn more. Are there any nutritional deficiencies because of removing wheat from diet? No, the nutrients present in wheat are found in other food items used to substitute it. Read about healthy gluten free ingredients to know more. There is debate within the international scientific community about the safety of oats on gluten free diet. Some studies have shown that oats are many a times contaminated with wheat. Moreover, 5-10% of people with celiac disease react adversely to the protein found in pure uncontaminated oats the same way they do to the protein found in wheat, barley and rye. Therefore, oats is included in the definition of gluten by some scientific bodies. We too have included oats in the unsafe list. Do cosmetics and toothpaste contain gluten? Are they harmful? Cosmetics and toothpaste may, at times, contain gluten. Whether that can cause any harm to individuals with celiac disease has not been studied extensively. Gluten needs to be ingested to cause a reaction. It is unlikely that one would swallow a significant amount of these items to cause reaction. However, individuals concerned about this may use products labelled gluten free and avoid any products which contain wheat, barley, rye or oats listed in their ingredients. Are meat, milk and eggs from wheat- fed animals safe to consume? Yes, these products from wheat eating animals are safe for those on a gluten free diet. Are injections and vaccines safe for my child? Gluten is harmful for individuals with celiac disease only when it enters the digestive tract. Intravenous fluids, injections and vaccines enter the bloodstream and not the digestive tract, hence are considered safe. Where can I get information about specific brands of packaged food products in India which are safe to be consumed on gluten free diet? Globally, a product is declared and considered gluten free if it has been tested as per some defined standards. Due to the lack of availability of such information in India presently, we cannot ascertain which packaged food item is safe to consume here. This information has to be sought from the manufacturer. Use our sample letter to write to the manufacturer. Why should you not start gluten free diet without being certain of the diagnosis? Once you eliminate gluten from your diet, it will be extremely difficult to confirm the diagnosis of celiac disease later. You can then never be sure if you actually have celiac disease. There are chances that you may not be having celiac disease at all and are still feeling better on gluten free diet as this diet virtually eliminates most junk food, processed food and additives which could be causing some of your symptoms! In addition, you will not be sure whether to follow the diet strictly or not. If you follow it strictly, you will be committing your money, time and energy to maintain a diet which you may not need in the first place. If you don’t, you will be increasing your chances of complications if you actually have celiac disease. You will also not know the risk your family members may have to develop celiac disease. Is it harmful for an individual with celiac disease to eat gluten containing foods once in a while? Yes. It is indeed harmful to consume gluten even if it’s once in a while. Read more. Yes, even a very small amount of gluten containing ingredient can prove to be harmful. Always make sure that you use certified gluten free ingredients. 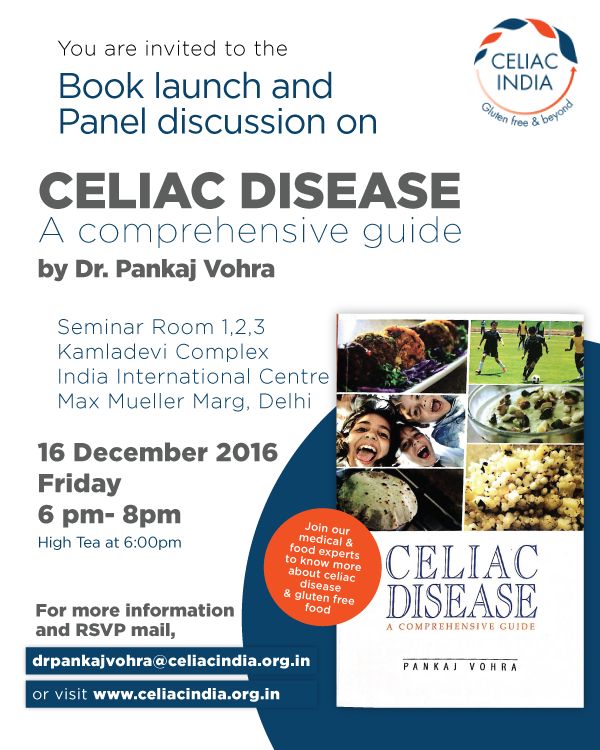 My friend has celiac disease but he does eat gluten containing items like pizzas, biscuits, kulcha, jalebi etc. once in a while. He does not experience any adverse symptoms and is doing fine. Why shouldn’t I do that? Your friend may not be experiencing symptoms after consuming gluten, but there will be damage to his intestine which could lead to severe complications and disorders. It is important to follow your doctor’s advice and urge your friend and other individuals with celiac disease to do the same. Very often, celiac individuals do experience many unrelated symptoms on eating gluten, which could be mild, but could become severe in the long term. You could read about some such patient experiences. Is a vegetarian diet healthy for individuals with celiac disease? Yes, vegetarian diet can provide all the nutrients needed for individuals who have celiac disease.